Think of this: in the old days advertising agencies could only guess at drivers for customer behavior. For instance, out of a million newspaper readers, perhaps 20,000 consumers (2%) would pay attention to a given ad. Out of that audience, perhaps 1,000 potential customers (5%) would actually take the next step and purchase the advertised product. But even though companies could analyze the numbers at the end of that sales funnel (the 1,000 customers who took action and engaged in recordable transactions), it would be next to impossible to come up with accurate, concrete numbers for how effective the ad actually was. Was it really 20,000 readers who paid attention? What if it was 100,000? Or what if it was only 5,000? What did they do immediately after they saw the ad? Before coming to the decision to buy, what factors did they weigh in their mind? What factors did they ignore? As you can see, so much of that traditional marketing amounted to guesswork. Ah, but with the Internet, we can pinpoint customer behavior and thinking patterns with amazing precision. Think of someone looking for a new pair of tennis shoes. He’ll go to a company’s website, and search for a specific style. He may narrow his search down to only include products within a particular price range. He may spend 3 to 5 minutes reading about the specs and details for a black pair of size 10 shoes. All of this data can be recorded and analyzed for marketing purposes. Now the owner of that shoe business has the ability to know that this customer is actively looking for a black pair of size 10 high top tennis shoes in the $10 to $30 price range. Do you think such microcosmic knowledge of consumer thinking patterns could help marketers effectively target and convert customers? The answer is obvious. No wonder some have compared the difference between digital and print marketing to the difference between a laser beam and a floodlight! Of course, we just used an extreme example at the bottom end of the sales funnel. However, fundamentally, we see why digital marketing can make such a powerful counterpart to traditional print and radio advertising. What are some ways the two can fit together? Using digital touchpoints as a barometer for customer engagement can inform how your company delivers its print, radio and TV ads. For instance, social media marketing that truly engages your consumer base can furnish your company with valuable feedback on what potential customers are and are not interested in. It can inform you of your product’s strengths and what you should focus on in upcoming advertising initiatives. As well as showing you how to best position your brand for your target audience moving forward. Customer feedback can even help you discover and/or refine your Unique Selling Point. With such valuable insights gleaned from the digital world, you can greatly enhance the effectiveness of your print marketing. Whether it’s because of convenience or cost savings, more and more people are purchasing their products and services online. An integrated marketing effort that coordinates print, video, and online interaction points can lead to increased sales. It increases even more when you use your website as the focal point for the next step in the sales funnel. We’re talking about flyers and business cards that advertise your website. Print and radio ads that prominently feature your website address. Even though print and other traditional forms of marketing may increase your brand’s exposure, more than likely your customers will actually initiate transactions, or at least conduct their further research, via your website. An online presence certainly makes it easier to gain and retain customers. Digital marketing that encourages subscription to a print (or online) magazine can increase customer engagement. Customers who create accounts on your website will probably make repeated purchases. Advertising and streamlining the sign-up process can boost the numbers of those who register. As your data on each customer increases, you will find it easier to personalize your marketing to each subgroup. This can be reinforced through traditional marketing, such as mailing lists. A marketing strategy utilizing digital and traditional marketing, allows your customers to see a full-circle view of your brand. Of course, it requires detailed planning and meticulous execution to achieve the optimal results. 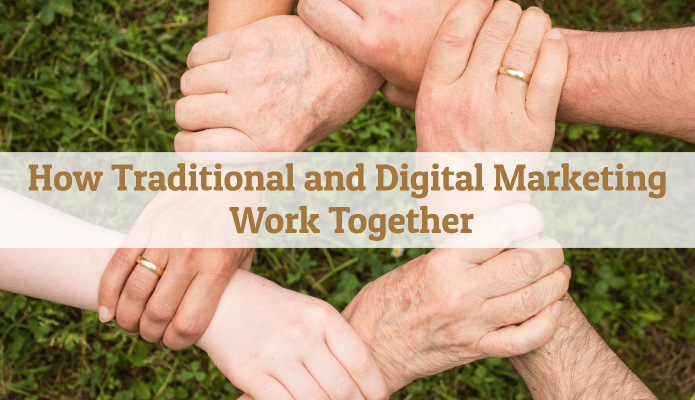 One option that many companies have utilized is seeking the help of a digital marketing firm that has partners and employees with a solid background in both digital and print marketing. Such experience has often proven to be invaluable in the creation of an effective marketing plan and continued business growth. DigiVid360 is just such a marketing firm. If you’d like to learn more about how DigiVid360 can help you enjoy the best of both worlds, contact us today.